Menorca, perhaps the least well known of the Balearic Isles, is much more than just secret coves and beaches. It has been aptly qualified as a great outdoor museum for the diversity of its landscapes and the quantity of prehistoric monuments it possesses. All of this, without forgetting the charm of its small whitewashed villages. The Menorcan's say that all the good things and the bad things have reached them from the sea. This is logical, bearing in mind that Menorca is an island. However this simple sentence summarizes more than 2500 years of history in which Menorca has been colonized by many civilizations. Fortunately, in spite of the human comings and goings, the island has not lost one iota of its personality. 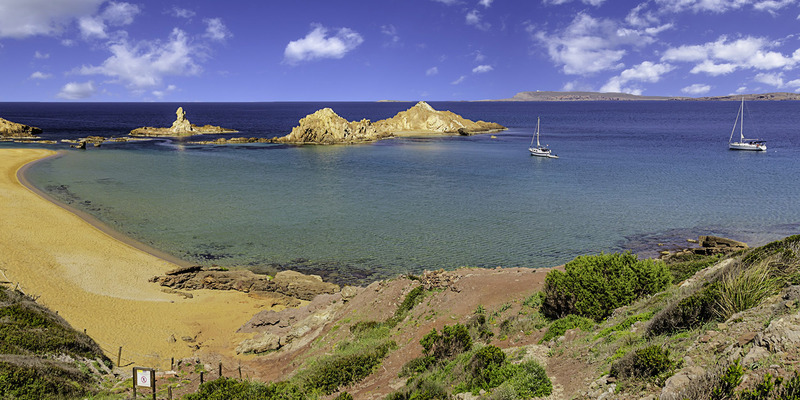 Menorca houses the best preserved natural landscapes of the Mediterranean. We have before us an environmentally unique place, which was declared a Biosphere Reserve by UNESCO in 1993. In the 702 m2 area we find a natural park (la Albufera des Grau), five nature reserves, one marine reserve and nineteen ANEI areas (Natural Areas of Special Interest). The island is a true natural paradise made up of a multitude of gullies, land caves and underwater caves, as well as unique species of animals and plants. The landscape and geology distinguish it quite considerably from Mallorca or Ibiza. The island is divided in two regions. The first, northern (Tramuntana) area is the most rugged where we find beaches with reddish sand and strikingly beautiful landscapes. The second region is situated in the south (Migjorn), it has a much gentler feel, with a coastline of cliffs, gullies covered in pine trees and coves of golden sand. The highest point of the island is Monte Toro, at 357 metres. The climate on Menorca is also different from the other islands. Its average rainfall is the highest of the Balearics, with 654 mm a year. The humidity is very high, causing a dew or "banyadura" to form in the first hours of the evening and morning. The average annual temperature of the island is 18,11˚C, with an average annual minimum of 13,90˚C and an average annual maximum of 22,33˚C. But without doubt the most characteristic element is the wind. As it lacks any protection from mountains, Menorca receives in full the air flowing in from the north. The dreaded Tramontana is dry and cold and predominates over the other winds. This unpleasant and howling wind easily reaches one hundred kilometres per hour. Evidence of its strength can be seen in the trunks of the wild olive trees, inclining towards the south. One of the attributes which best distinguishes the island of Menorca, as well as its beautiful hidden coves and crystalline waters, is its gastronomy. The Menorcan cuisine revolves around fresh fish and shellfish, as well as the products from the interior of the island. The most renowned dish is without a doubt the Caldereta de langosta, (lobster stew), a speciality found across most of the island, but its indisputable mecca is the charming port of Fornells. The town centres, especially in Maó and Ciutadella, are full of exclusive shops with traditional Menorcan products. Although the star product amongst visitors is undoubtedly the shoes, consolidated on a national and international level. Design, quality, craftsmanship and the latest technology in the production process is what you will find in the different shops and shoe factories in Menorca. Jaime Mascaró and Pons Quintana are the best examples. However the most popular shoes are the Abarcas. Originally farming shoes, these comfortable and simple shoes are today exported to a good part of the world, with many designs, colours and types of leather. Menorca offers unbeatable opportunities for combining sport with the enjoyment of nature. Those keen on the sea will find a range of possibilities, from a swim in any of the island's coves, to specific activities such as windsurfing, sailing, water skiing, sports fishing, lateen sailing or scuba diving. Or those who are nature lovers can enjoy the islands environmental diversity whilst cycling or hiking along the emblematic Camí de Cavalls, a circular path which allows you to trace Menorca's perimeter completely. Though it is true that for many the best way of following the Camí de Cavalls is on horseback. Finally, those passionate about golf are also catered for. The island has one golf course in the urbanization of Son Parc, on the north coast of the island. The Son Parc Golf has 18 holes. The delights of this tranquil Balearic island await you! Island Yachts Broker goes much further than simply putting a seller in touch with a buyer. In addition to managing the sales process, including legal advice and supervising the vessels registration to the final change of ownership, we provide all boat care services (restoration, repairs and maintenance, equipment installation, supply of spare parts and accessories,...). In the same vein we have become specialists in nautical holidays, and our objective is to ensure that with our help you have everything you need, without you having to waste any time or worry. We can help you find accommodation which is most suited to your needs, -hotels, agro-tourism hotels, villas and/or apartments, -,... as well as putting you in touch with car hire companies, estate agents and travel agents. Island Yachts Broker supports sustainable tourism, in accordance with our Natural Biosphere Reserve. Please help us maintain the essence of the island of Menorca during your stay. Welcome to Island Yachts Broker!